Sehr schönes und gepflegtes Haus. Das Zimmer war groß und gut eingerichtet, Der Empfang war herzlich. Auch die Abmeldung lief problemlos. Wir würden jederzeit wieder dort buchen. Friendly and helpful staff. Well equipped rooms, with additional washing / drying facilities in communal areas if needed. Spotlessly clean. Convenient location on outskirts of Jonzac. Very nice apartment with big balcony, comfortable and clean. This is near of congress centre and Les Antilles water centre and about 12-15 min walk to old town. My team and I are delighted to welcome you to our Holiday Residence in Jonzac! We have at heart to make you discover or rediscover this beautiful region, rich in heritage, soil and nature. Plunge yourself into an authentic voyage of discovery in the Cognac region and visit its vineyards. For a perfect stay, choose our new residence, opened in June 2018. Immerse yourself in nature and all things good for your body in the heart of the 8th thermal spa of France. Enjoy a relaxing stay in a charming city with authentic character, and take advantage of a unique wellness area. In an exceptional setting, organize your spa treatment in Jonzac. 500 m from the city center, the holiday residence “Les Coteaux de Jonzac” will enchant you with its modern style. Take our time in our comfortable apartments and studios with terrace in a green natural landscape. This holiday residence is the ideal place to live unforgettable experiences with your family. Enjoy the water park "Les Antilles" or the leisure centre. Come and discover the sliding games or water sports: Canoeing, optimist, windsurfing, stand-up paddle. In the heart of Charente-Maritime, ideally located between Bordeaux, Royan and in the heart of the Cognac vineyard, the charming thermal spa town of Jonzac will delight you with the richness of its terroir and its historical heritage. A lively region, rich in discoveries. In an environmental approach, the holiday residence is equipped with a geothermal heating system, photovoltaic panels. In the heart of the Charente countryside, our holiday residence offers you the tranquility of its refined apartments for an ideal stay in Jonzac. Between natural sites and animated urban spaces, choose the Coteaux de Jonzac for a bucolic escape. In a natural environment, our 90 apartments and air-conditioned studios will seduce you with their contemporary style. This oasis of greenery and relaxed atmosphere is a great place to hang out with friends or family. Take your time to explore the town of Cognac, a lively city with a great reputation for foods and the famous drinks! Close to the most important sites of the city, our holiday residence is an amazing place to discover surroundings, nature setting for incredible days out. Our holiday residence invites you to enjoy the famous thermal baths for a wellness moment. End of stay cleaning: 49€ to 77€. Restaurant nearby: the Casino restaurant welcomes you at 30 meters from the holiday residence. Only open at lunchtime, the restaurant of “the Antilles” proposes delicious formulas, menu of cocktails, ice creams, pancakes... Enjoy all year round its panoramic terrace overlooking the swimming pools! Our residence is ideally located to take advantage of all the sports facilities and enjoy many fun activities. For all those who prefer relaxation and fitness activities, our teams invite you to discover the best thermal baths, spas and wellness experiences in this region. 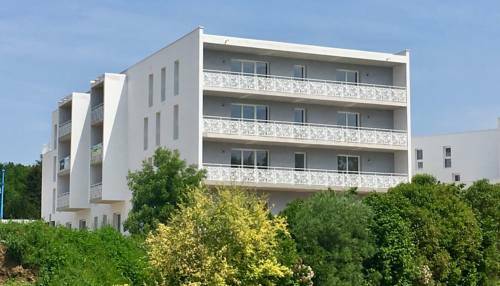 In front of the residence, you directly join the bath sports and leisure centre which includes the Casino, the aquatic park “Les Antilles” and the nautical base of the “Val de Seugne”. Take a wellness and wellbeing break in the relaxation area of the park. A great setting that is perfect for releasing the weight of modern living. Enjoy moments of softness: sauna, hammam, roman bath and jacuzzi. Our residence “Les Coteaux de Jonzac” offers you a free entrance to the aquatic zone during your stay. Relaxation area: water at 32°, hydro massage, counter-current swimming pools, sauna, hammam, roman bath, Jacuzzi. Beauty area : 2 packages (with access to the Relaxation area included). Want to take care of yourself? Relaxation room of the aquatic park “Les Antilles” welcomes you for a wellness moment. Enjoy the hydro massage or the huge swimming pool, sauna, hammam, roman bath and Jacuzzi. Discovery offer 1 hour: 1 freshness facial and 1 Californian massage. Access to the Relaxation area included. On 2 days - 3h30: relaxing massage of the back and facial care, relaxation, complete body care, balneo with essential oils, exfoliating face scrubs and Californian massage. Access to the Relaxation area included. Let’s be tempted by this highest thermal baths in this region with ancestral traditions of wellness. Come and relax in ancient cathedral and enjoy the benefits of Jonzac waters. The troglodyte baths will plunge you into a refined atmosphere with sumptuous decor. How to sublimate your skin? Experience the thermal treatments and aromatic models. And to those who dream of massages with essential oils will be proposed to you. Put yourself in expert hands of their practitioners who will revitalize you. In the troglodyte baths, spaces dedicated to phlebology, lombalogy, rheumatology and respiratory tract are at your disposal. The therapists offer you specific and tailor-made treatments in an exceptional place between cabins, swimming pools and mud baths. The leisure centre is ideal place to navigate the zip lines course if you love aerial adventures. Strong emotions for the whole family! For all water sports enthusiasts, experience the stand up paddle. A fitness and leisure passport is ideal to fully enjoy this multi-activity at discounted prices. When the good weather arrives, stroll along the pond and opt for a family picnic. To take advantage of the local delicacies, make yourself at home in the restaurant de la base. A creative touch invites Jonzac in the old corderie de la Ville, offering pottery, mosaic and textile workshops. The Jonzac Casino, just a stone's throw from our residence, is the perfect place to spend a pleasant moment of entertainment with friends or colleagues. For a gourmet break, a restaurant is open all year round to offer you delicious moments of sharing. Our holiday residence offers you an exceptional setting to fill up with entertaining activities. Our residence offers you an exceptional setting to fill up with entertaining animations. After a good dose of entertainment, come and relax in our comfortable studios and apartments. Discover the thermal baths and spa of Jonzac! For those who like green setting? Jonzac is a perfect little thermal town to visit, just only 45 minutes from Bordeaux with natural treasures. Our holiday residence is ideal for enjoying the surroundings (vineyards, beautiful landscapes…) with plenty to do and see in the area for the whole family! Let’s be tempted by the amazing aromas of cognac. You can have the opportunity to discover this wine at the Jonzac vineyard house with an authentic atmosphere. All the year, escape to the woods and spend some time exploring the Beautiful area along the hiking trails. Jonzac is absolutely perfect with its diversity of vineyards and countryside, offering walk through the idyllic natural setting. Take a breath of fresh air and immerse yourself in nature, you discover quiet and authentic site. You will appreciate the panoramas of Charente-Maritime region and take a walk along cross the “Seugne” River and enjoy the traditional products and sites: two windmills "Cluzelet" and "Bret". Take a detour to Castle of Jonzac, the symbol of the old town. The Castle is itself on a rocky spur; raise your eyes to contemplate its sublime facade. Follow the path with rounded corners where you can admire one of the most beautiful views of Jonzac. Close to our residence, explore the historical center of the city by taking the narrow medieval alleys of “Champagnac” and “the Black Galleries”. Your discovery of Charente culture will continue with the Hall of Baltard Style, one of the most emblematic markets in the New-Aquitaine region. Along the streets, the graphic square near the Romanesque church will enchant you with its wonderful play of lights, distinguished by the guide "One hundred most beautiful detours of France". At the end of the day, come and see musical performances in the Castle. One of the courtyards was transformed into an adorable Napoleonic theatre for an amazing evening. The unsual ways to discover Jonzac ! Take quality time with your family or friends to participate an exciting treasure hunt in the fabulous Renaissance decor of the “Château des Enigmes”, 20 minutes from Jonzac. Take part in the discovery archaeological at Villa Gallo-Romaine with archaeologists. Come and explore Jonzac's history differently through the ages. Not far from the castle, take a walk in the fabulous medieval garden of the "Douves", let yourself be charmed by its vegetation, smell the exquisite and natural scents of plants. For those who love tranquility and quiet place? Make a detour to the arboretum of the “Mail de Seugne” where magnificent trees and local shrubs have been planted. You can embark on a leisure boat cruise or fly away in a hot air balloon to enjoy the remarkable landscape of the city and its surroundings. For any information, consult the Jonzac Tourist Office. At 1h30 from Jonzac, stop at the “Ile d' Oléron”! Take a breath of fresh air on coastline of the “Cotinière” and visit the famous the “Fort Boyard” by boat. Go for a walk in Royan along the beaches and its charming and historic marina. As a couple or with friends, discover the charming city of “La Rochelle” and its arcaded streets. 3 health courses in the valley around the Antilles of Jonzac, the leisure base and the Windmill of Bret..
Troglodytic thermal baths, its hyper thermal source, unique by its temperature at nearly 60° C. The best source for trace element and rich of sulphur. Jonzac's leisure base, a real "Parc de Bonheur de l’eau": in free access, the place offers the visitor the possibility to swim in a lagoon with a fine sandy beach. From Paris, take highway A10 direction Orléans/Nantes, keep going down on the highway direction Jonzac/Pons. The holiday residence is near Casino and Thermal Baths of Jonzac. Airport of Bordeaux/Mérignac - one hour from Jonzac. Pets admitted: 8€/night, subject to having been notified at the time of registration, acceptance of hygiene rules and veterinary regulations (have the vaccination card up to date). Animals must be kept on a leash throughout the property. Do not accept dangerous animals (categories 1,2 and NAC). Our staff is aware of the need to welcome customers with disabilities.. RENTAL PACKAGE : Accomodation, Television, bed linen and towels, housekeeping equipment, free car park. Free entrance to the Aquatic Park "Les Antilles" (depend of the openning and closing schedule). RENTAL PACKAGE : Accomodation, Television, bed linen and towels, housekeeping equipment, free car park. Free entrance to the Aquatic Park "Les Antilles" (depend of the openning and closing schedule)*. * The access right to the Antilles of Jonzac is subject to the opening hours of the spaces and the periods of partial or total closure decided by the Park Manager. The adoption of such measures, which are external to Vacances Bleues, will not justify any price revision.